In addition to simple, functional fabrics in various qualities, our vertical collection offers, among other things, stylish jacquard-woven fabrics with subtle micro patterns and sophisticated natural fabrics with a pure look and feel. They add a new, decorative dimension to the vertical blinds. Besides transparent and translucent fabrics our plain collection for vertical blinds also includes black-out and flame-retardant varieties. The large variety in fabric types and the broad color palette in which our collections are available are special aspects of our product range. In addition to timeless neutral tones a number of trending colors have been included as well. With a beautiful texture and luxury yarns in warm colors, jacquards create a high-quality interior atmosphere. 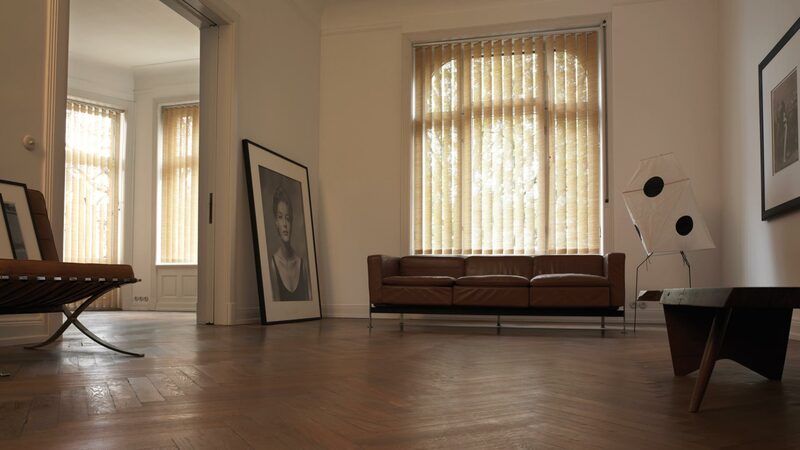 They give the blinds an exclusive, stylish look and feel. The micro patterns in particular stand out on the small width of the vertical vanes. The designs in our collection are inspired by classic weaving patterns. 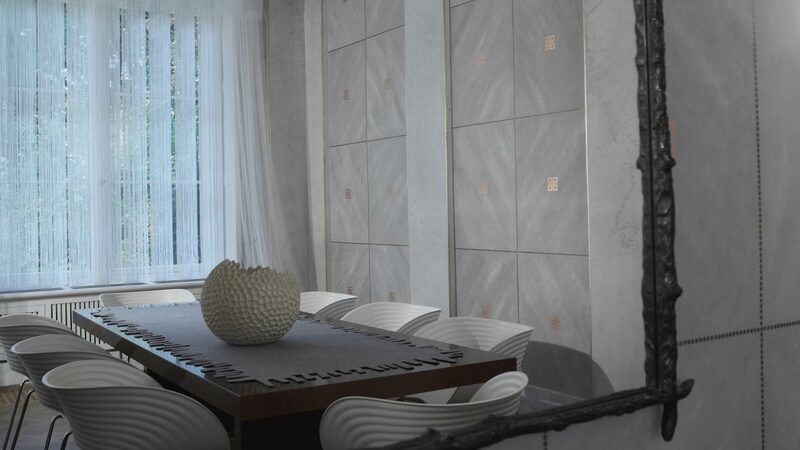 By giving them a modern touch, they are completely up-to-date and match both classic and modern interiors. r.
The way in which the natural materials and sophisticated weave structures in our collection filter the light is unparalleled. In addition to paper fabrics, linen varieties in a pure color scheme are also part of the collection. They are available in pure colors. 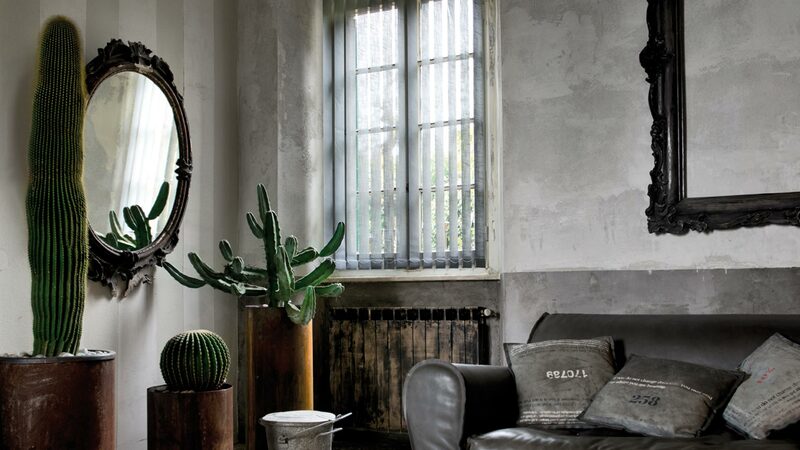 These timeless natural fabrics turn blinds into lovely eye catchers. Screen fabrics are ideal for controlling heat and light. 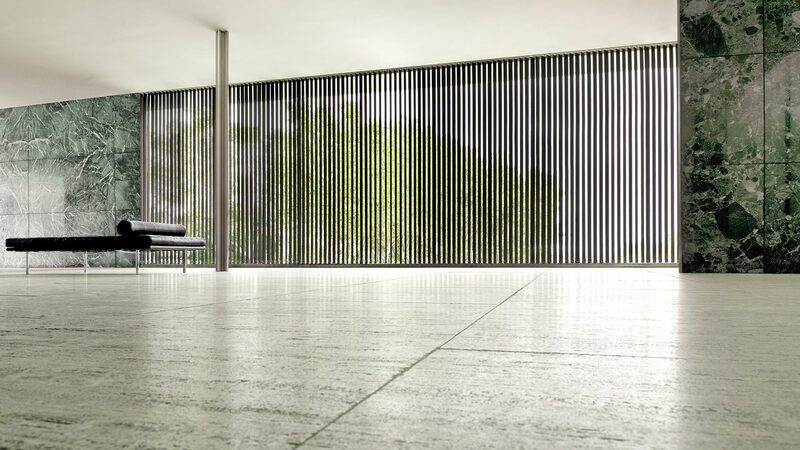 Using screens in vertical blinds is a perfect solution for spaces where this is important, such as offices. Our screen fabrics are flame-retardant and proven safe for people and nature. In addition to basic screen fabrics in timeless colors, our collection also includes exclusive decorative varieties with their own feel, such as screens with a metallic shine or a natural linen look. 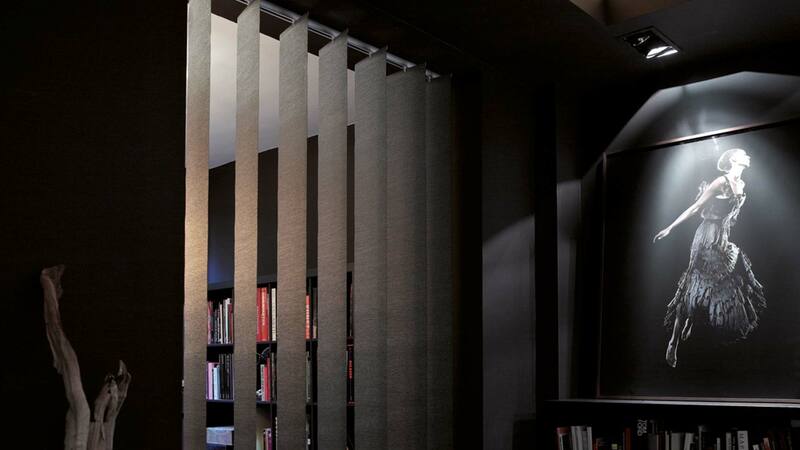 Strings add an innovative and playful touch to vertical blinds. The open structure creates an airy feel and a subtle see-through effect. In addition to a variety in natural tones, the collection also includes a large number of trending colors. In addition to a broad and innovative collection of fabrics, our product range for vertical blinds offers a versatile, efficient system. The Absolute system is user friendly as well as easy to assemble and install. The modular structure makes it easy to upgrade the system from basic to full-option. We have developed a unique system for vertical blinds to offer high-quality and time-saving options for every situation. 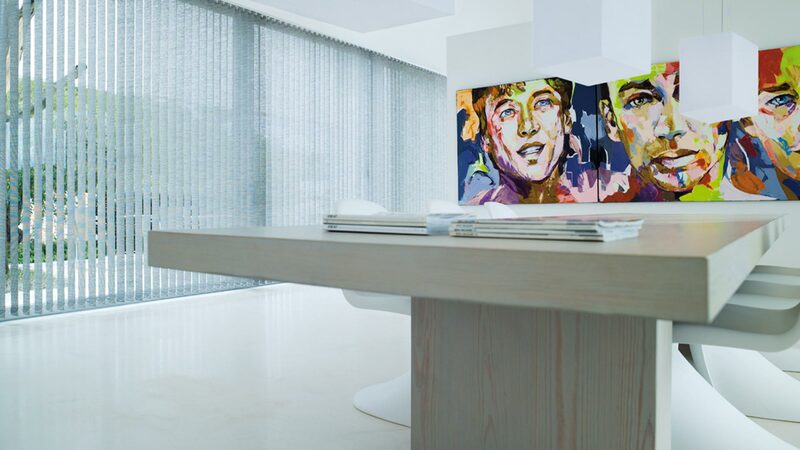 The Absolute roller blind system with a mounting profile forms the basis for this user-friendly roller blind system. It is easy to assemble and install. The modular structure allows for an easy upgrade to a full-option system with automated operation with a minimal number of parts. Download the technical catalog of this system here. The warm fabrics in our new Contract Collection add an attractive look and feel to vertical blinds. The natural textile look of the fabrics, including wool, linen and cotton looks, creates a warm atmosphere in the interior. This new contract collection is a special mix of new and existing fabrics. The flame-retardant qualities and the extra wide width of 280 to 300 cm make the fabrics perfect for the contract market. 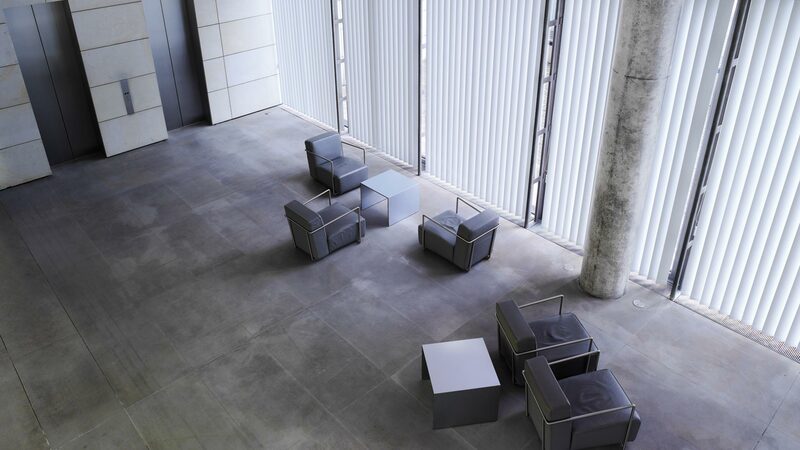 The new items in the collection are characterized by a natural textile look and feel. The wool and cotton look fabrics in the collection add atmosphere and warmth to the interior. The fabrics are suitable for roller, panel and vertical blinds. View a mood impression of this new collection here.